This is a good point. The packaging could have been old stock. There is no reason they wouldn’t use stock on hand to package the devices. The minimum number they’d have to order would also have no reason to be the exact same number as number of devices being built at any given time. Just because the display component has been changed doesn’t mean the software has! Chill out. It’s an OP-1. Remember why you dropped over a grand on it, be thankful you actually managed to get one, and just play it and enjoy it. Or get three behris for the same money and be happy :)? 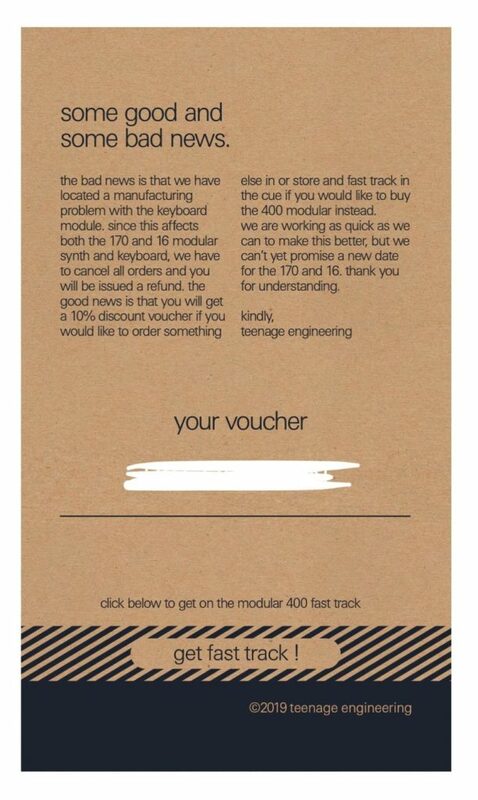 Is it possible that TE have serious cash flow problems and are selling off a limited supply of OP-1 “returns” that they’ve refurbished and re-serialed in order to keep themselves afloat? PS: just to add some balance… as a PO and OP-1 owner, I am absolutely blown away by my OP-Z and the amount of creativity it inspires. I think that the FACTS speak for themselves and the conclusion is rather obvious. TE announces out of the blue and accepts preorders for 3 modulars which are not even produced yet, tested …nothing. They are available ONLY through their store. I have no idea how many they made. We can safely assume that since they where out of stock very quickly a hefty sum was collected. TE announces that 2 of the products will not be released. Remember we are talking about products that they have already printed manuals for!! The 400 modular is released with many, to say the least problems. The product was fast released. The op1 was refurbished and resold as new at least since 2016. I know that for fact. I went through 3 non working op1s bought from online German stores at that time. All 3 units had the same problem. Thank god the i was NOT dealing with TE but big online stores, 3 different ones! I would receive an op1, same problem always and send it back. I still have the serial numbers and all the emails from the shops. At one point i called the shops one by one. To make a long story short i was told this. A lot of op 1s where returned and sent back to TE. When i asked if i was receiving a refurbished , B stock item , i was told that technically YES!. When i asked why isn’t it listed as a b stock and priced accordingly i got this reply. "We can only sell something as b stock if the buyer sends back a fully working item. If TE sends us back refurbished items as new we pay the full price therefore we can only sell them as new. Thats the reason that many boxes at that time where not in the best condition as well… They where sent multiple times. I WAS TOLD ALL THIS BY 2 SHOPS. 4. The only way TE could " keep the cash " flowing and not have to deal with huge shops that have 14 days max for refunds was to only sell from THEIR store. Thats what they did. They can take their time and keep you waiting for months on end. 5. At the moment their is hardly anything for sale on their store. 95% of the items are out of stock with not even a hint of when and if they will appear again. Does that sound like a company in trouble. Undeniably yes. Well okay, i mean…that sounds plausible. They also skipped a few major trade shows in the recent past… could that mean they don’t have cash to rent space at those events? I also have pretty much everything they have made but I’ve decided to sell everything. I just feel they are really sketchy and I can’t support them anymore. That’s just me though, if you’re happy with their stuff then rock on. TE announces out of the blue and accepts preorders for 3 modulars which are not even produced yet, tested …nothing. My speculation is: They’ve planned and designed the Modular series, have tested them in many beta and pre-production stages and finally made the step into production. When the shipment was in arrival they put it into the shop. They never said that. There was a serious bug / design error in the keyboard module. Obviously they need time to fix that, so the 16 and 170 are not available until an updated batch has been produced and delivered. I agree with that. Obviously there are some issues in the first production batch of the power supply module. The modulars appeared one day at their site. That was it. What they did before you are speculating , not me. I don’t know. I am judging from the end result. I got one and sold it after 3 days. It was in no way ready for release, nooo way. Remember the opz was flaunted around shows and stuff for 3 years before it was finally released. The 2 other modulars they have said NOTHING about. Again i can just state facts. They were never even assembled just to show us what they do. There where lying on a bed as sheets of metal and included in the manual. If there was at least a preproduction model they had that worked i can assume they would show it. You do not collect money for a product unless you know you can sell it, if there was a serious bug / design error in the keyboard module i have no idea. But they got payed for these. I honestly dont care what they do from now on because i cannot accept their attitude with support , pricing etc etc. Thats my opinion. I think that when a person like “gerotake”? i dont know if i have the name correct, posts that he will sell all his TE stuff and most probably delete his sample import tool he made for the opz because he is fed up with them is enough…for me at least. The 2 other modulars they have said NOTHING about. I can understand why people are upset by the recent behaviour of TE. But I’m more fed up with the permanent hating and nagging in this forum by some users. Instead of replying on problem reports with cynicism we should support the users and give some useful advice. Its funny how the photo you posted above just proves more what i said. 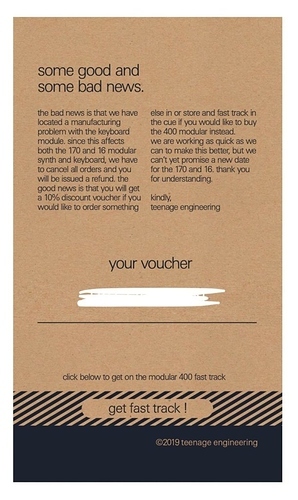 You got a voucher for 10% less. Good. No hint as to when would that be? a month? a year? “we cannot promise …blah blah…” They obviously prefer keeping the money for as long as they can than sending it back…isn’t it obvious?.. What exactly is the “hate” factor here? Do i write lies? No one is stopping you from buying everything they release and hopefully enjoy it without problems.